We're delighted to let you know that we've just released some fixes that are specific to the new Compose editor. While the majority of TypePad members who are using the new editor have experienced no problems at all, we know that some of you have experienced some exceptionally frustrating errors. Our Support and Engineering teams have been working really hard, burning the midnight oil to address these issues and are excited to see them launched today. In addition to these fixes and those we released on June 11th, some additional fixes are forthcoming and we will keep you posted as we release them. All members who have the new Compose editor should receive an email giving details on the most recent fixes. You can also read about known issues and fixes on the Known Issues blog. A huge thank you to everyone who has sent in feedback to our Support team and to our CEO Chris Alden. Our teams have reached out to many of you one on one and the information you've shared with us has been a tremendous help in our troubleshooting and beyond. Also in this release are several new themes, including something for nature enthusiasts, fans of colorful illustrations and even a theme for those of you who still remember the old school typewriter. TypePad Celebrates "Take Your Dog To Work Day"
Did you know that today is Take Your Dog To Work Day? The Humane Society of the United States are proud supporters of Take Your Dog To Work Day. The organization's President and CEO Wayne Pacelle is an active blogger who says that having their dogs around at the office "reminds us of who we're working for". Established in 1954 and blogging since 2007, the Humane Society advocates sensible ways to help animals all across the country, from shelters to Congress, and makes the world a more humane place for all of us. 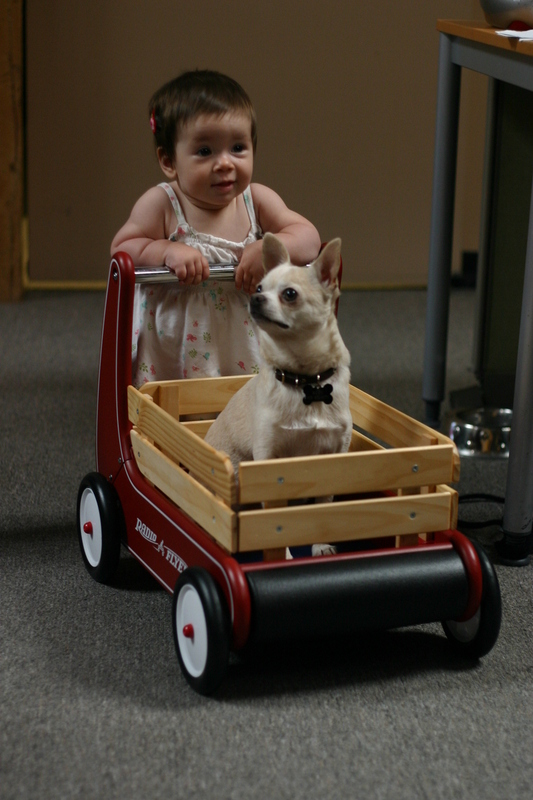 Over on the Humane Society's TypePad blog they're even holding a caption contest for the hard-at-work Piper (an adorable chihuahua mix). Almost every day is Take Your Dog To Work Day here at Six Apart, as you can see below. 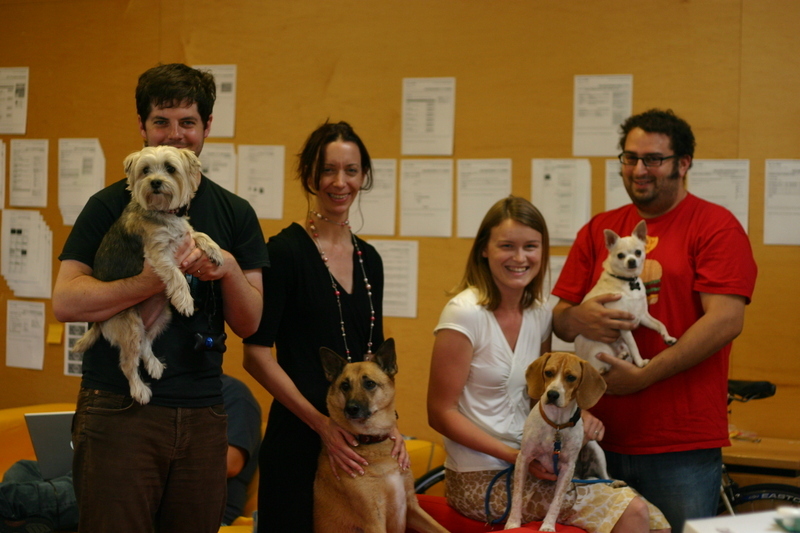 Did you celebrate Take Your Dog To Work Day today? This morning you may have experienced some downtime on TypePad. We know you rely on us to provide superior service and performance, and this morning we let you down. Downtime on your blog is obviously frustrating, both for you and for us, and we are very sorry. I'm writing to assure you that this is unacceptable to us and explain some of the background for the disruption. 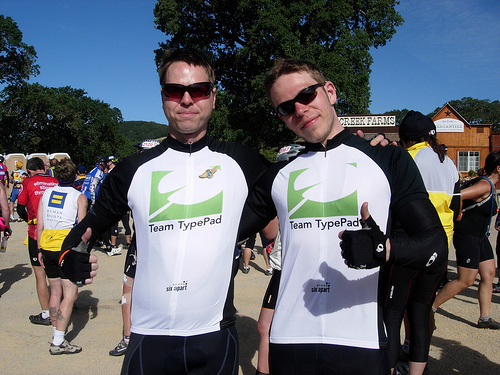 In January I wrote that 2008 would be a year in which there would be more development on TypePad than ever before. You responded with loads of encouragement, requests, suggestions, critiques, and compliments. In the past few months you've seen a lot of activity here on TypePad, which I'll talk about more below. To deliver on your feature requests, we've been making some significant changes under the hood. Over the past months, we've been in the process of moving all TypePad blogs to a next generation platform that will allow more personalized features for you and your readers, and more integration with other web services. We have tried to do this with as little disruption as possible, but clearly we haven't been perfect. We want you to know that we have our entire TypePad operations and engineering team focused and dedicated to minimizing these transition issues. Over the summer we will be emailing you, blogging on Everything TypePad and putting alerts into your account dashboard to let you know about the progress we're making to migrate your account and to introduce you to the new features we're building. I'd like to thank you for your input over these past months, and patience during this time as we make the final push to completing this transition. If you run into any problems or have any support needs or questions, please don't hesitate to consult support.typepad.com or file a support ticket through the "Help" link at the top of the TypePad application. And please do continue to email me with your comments, questions and concerns. The four winning themes from the "What Do You Have To Say?" contest are now available! Your choices are “River at Night" by Teresa Jones (1st Place), “Live and Learn” by Li Kim Goh (2nd place), "Vector Drips" by Terri (3rd Place) and the People's Choice Award winner “Shiny” by heythisisnoah. To choose one of these themes, head to the TypePad Design tab, click on Change Theme and select "New Themes" from the dropdown menu. Back in February, we let you know we were bringing themes over from our sister service Vox and asked you to vote on which you'd like to see first. 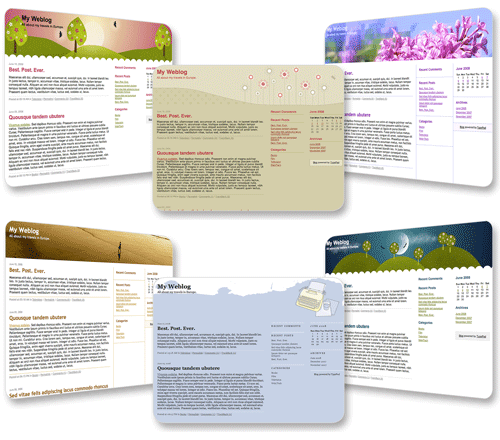 We've added another batch of those Vox themes, including Bookworm, Draft, Reading, and Modernist. To see all four color variations of each of these themes, head to the TypePad Design tab, click on Change Theme and select "New Themes" from the dropdown menu. Also in that poll, the cityscapes of New York City, San Francisco, Tokyo and Paris came in as your second most requested and we released those back in March. Due to their popularity, we've also added cityscapes for 16 additional cities, from Austin, TX, to Washington D.C. Did we add your city? Head to the TypePad Design tab, click on Change Theme and select "Cityscapes" from the dropdown menu to find out! Two of our Six Apart staffers rode in the recent AIDS/LifeCycle 7, a 545 mile fundraising ride from San Francisco to Los Angeles, and we're so proud of them we wanted to tell you their story. TypePad has a history with the ALC event, with this being staffer Jamison's third ride and also (thanks to Jamison) the third year the event has been chronicled on the ALC TypePad blog. With over 3,000 participants (2,500 cyclists and 500 roadies) this was the first year the event actually had to close registration because they got so many riders! On the ALC7 blog, five participants reported from the event through personal stories, daily video podcasts and photo albums. The ride days were long, anywhere from 40-100 miles a day for seven days, but as you can see the roadies took care to offset the grueling days with a lot of humor at each rest stop. It was Six Apart staffer Alex's first ride, and although dehydration downed him on day three, he rallied and finished and has already signed up for next year! Jamison used Blog It to post updates from the road all week to his blog and to Twitter, as his only internet access was via his iPhone. "Blog It was awesome," said Jamison, "especially when Twitter was down because it saved the updates and posted them when it was back up!" We have even more good news for iPhone and iPod Touch users. 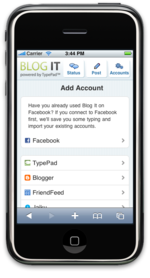 Back in April, we launched Blog It Powered by TypePad, a Facebook application that makes it easy to blog or micro-blog from within Facebook to let friends and colleagues around the web know what you're posting. 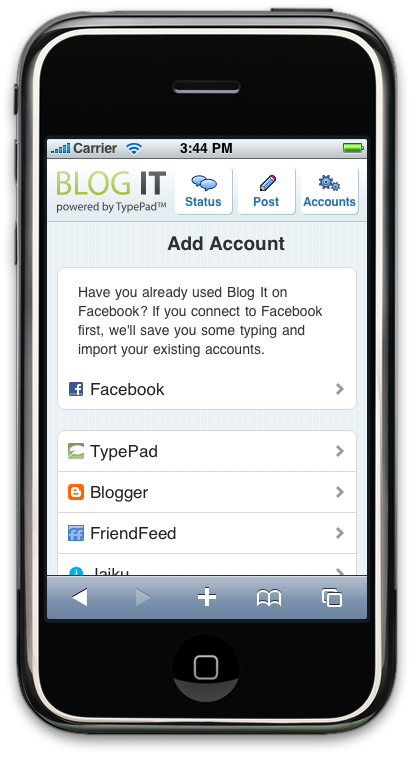 Now, the most popular blogging application on Facebook is available on your iPhone. Today we're releasing Blog It for iPhone, a free web application built specifically for iPhone's Safari browser that lets you post blog entries or status updates from wherever you are to more than a dozen different online services. Since Blog It's launch, we've made some great improvements to it. In May we added support for Markdown so you don't need to write HTML by hand; and in June we added support for FriendFeed and Jaiku, to bring the total list of services we support to thirteen. Blog It now supports creating content on Blogger, Facebook, FriendFeed, Jaiku, LiveJournal, Movable Type, Pownce, Tumblr, Twitter, TypePad Vox, WordPress.com, and any WordPress.org site. 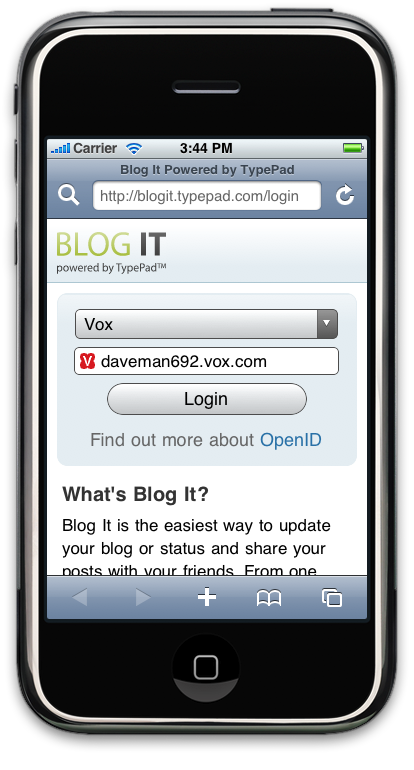 To try it out, open Safari on your iPhone, go to http://blogit.typepad.com/ and select "Add to Homescreen" to install the Blog It icon onto your mobile desktop. 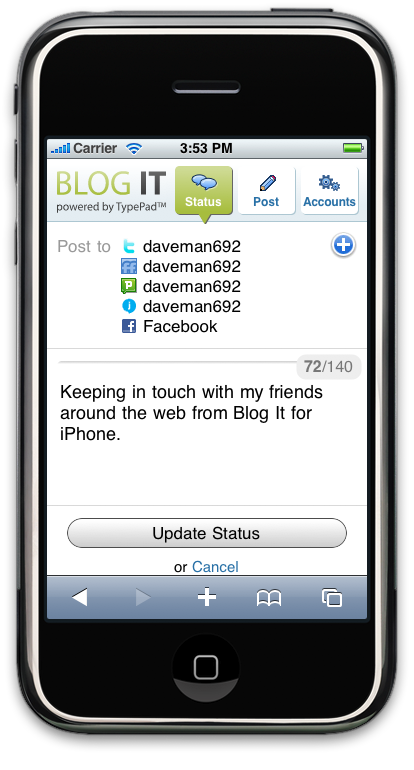 Click on the Blog It icon and start creating simple blog posts and/or updating your status message. When you log in with Open ID, you only have to log in once; the system remembers your information until you log out. No need to enter your contacts twice: If you've used Blog It on Facebook before, Blog It will import all your other blog accounts. Twitter users have the option to update your Twitter status with blog post titles and a link to the post. It can take a long time to update four or five different accounts individually, especially on a slow connection. When you use Blog It, your phone connects just once, and we do the rest of the work for you. 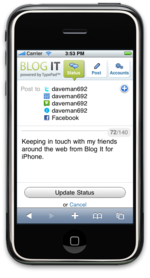 Blog It for iPhone continues Six Apart's long tradition of providing mobile blogging applications that support over 90% of smartphone platforms, including Symbian Series 60, Windows Mobile, Palm, BlackBerry, iPhone and iPod Touch. 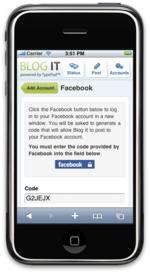 Read more about TypePad's Mobile offering. 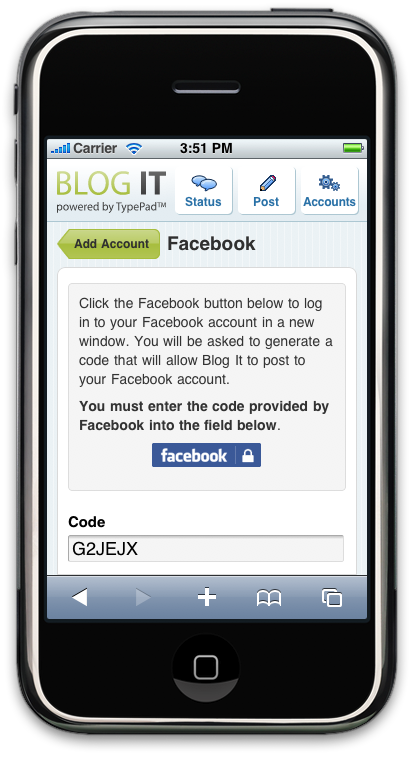 Blog It is free and available for anyone, so feel free to tell your friends and blog readers who don't yet have a TypePad account. 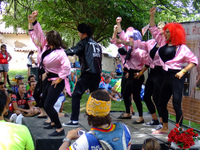 Head to http://blogit.typepad.com to get started! We'd like to thank those of you who have the new Compose editor for your patience and help with reporting some of the bugs and issues you've seen. Our engineering team has been hard at work addressing the issues and we're excited to report that a batch of bug fixes was released yesterday. To help track bug fixes and known issues affecting a large number of TypePad members, we've just created a new Known Issues blog at http://everything.typepad.com/knownissues. You can stop in there to check if the issue you're having is documented and what the status is on a possible fix. If you don't see your issue listed, please let our Support team know by opening a help ticket. Those are just a few of the issues we fixed. To view all of the resolved issues for the new Compose editor, visit the Known Issues blog and click on the "resolved" category. Thanks again for your feedback and patience, and we'll keep you updated here with news about the latest fixes and releases. Big news for TypePad members came straight from Steve Jobs’ keynote speech at the Apple Worldwide Developers Conference this morning. 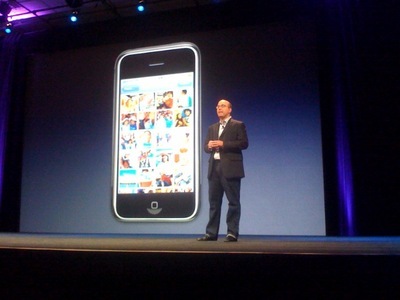 Our own Michael Sippey demonstrated the forthcoming native TypePad application for the iPhone during Jobs’ speech to over 5,000 attendees. The iPhone SDK (software developers’ kit), released in March of this year, has been downloaded over 250,000 times and used to create thousands of applications for the iPhone. Jobs invited representatives from just a handful of these applications to demo what they’ve built for the iPhone, and the TypePad team felt extremely proud to be included! CNET's News.com has some great coverage of the TypePad demo. This application continues Six Apart’s mission of bringing blogging mainstream by taking cutting-edge technology and making it accessible to everyone, just like the iPhone did last year. 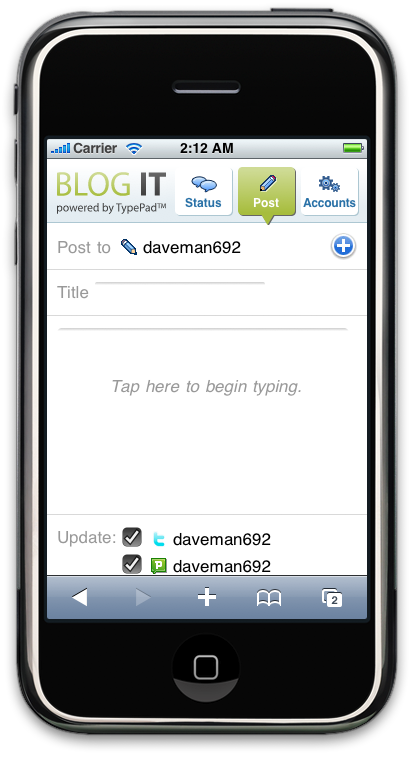 TypePad now supports more than 90% of the worldwide smartphone market, including Symbian S60, Palm, Windows Mobile, RIM, Blackberry and iPhone, making TypePad the undisputed leader in mobile blogging. Please note that the native TypePad application is not yet available – the free download will be available as soon as Apple opens up their application store in iTunes. We don’t know when the store will open, but we’ll let you know as soon as we know! 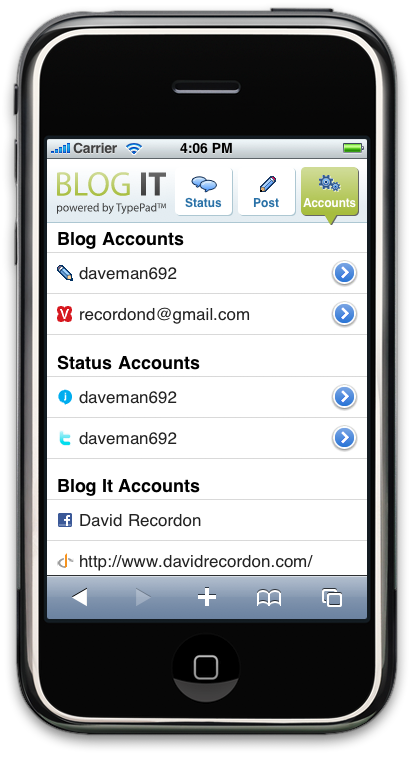 You can sign up to receive an email notification as soon as the native TypePad application for iPhone is available. 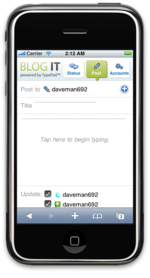 Even though you'll have to wait a little while longer for the native app, TypePad members were still the first bloggers in the world to get a specialized iPhone interface with the release of i.typepad.com back in September. 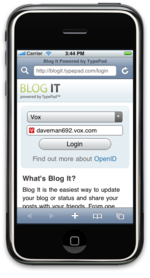 If you own an iPhone or iPod Touch, you can already take full advantage of the optimized blogging interface via your Safari browser at i.typepad.com. 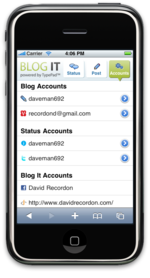 TypePad.com has more information about TypePad for iPhone. Have you ever wanted to increase traffic to your blog, but you weren't sure which social media and sharing sites to reach out to, and how? On Tuesday, June 10th at 1 pm Pacific, join us for an informative session about current trends in sharing your blog content around the web. With so many choices out there, we'll discuss how bloggers can extend their reach quickly and effectively. TypePad's own Andy Wibbels and guests from ShareThis will host this informative talk about on how to get the most out of social media using the ShareThis plug-in. You can tune in to this webinar right from the comfort of your computer. Space is limited, so if you'd like to attend, please reserve your spot by emailing webinar AT sixapart.com. Last week, we announced TypePad AntiSpam, a spam blocking service that's already built into your TypePad account. If you want to go further with protecting your weblog from spam and other unwanted comments, TypePad has even more tools that will make you a spam fighting superhero! The Word and IP Banning page, found in Control Panel > Site Access, can be used to ban IP addresses, keywords, phrases, URLs and email addresses. The form will accept any string of text, allowing you to cut spam comments off before they ever reach your blog. But be careful: the tool is powerful, so you'll want to consider whether a legitimate commenter might use a banned word or URL before adding it. There's more information about Word and IP Banning in our Knowledge Base. 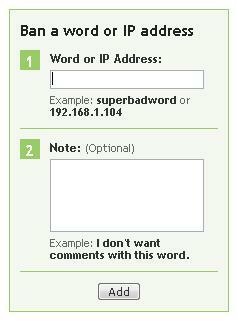 There's an option to enable comment moderation, available in Weblogs > Configure > Feedback. Comment moderation allows you to see a new comment first instead of automatically publishing it to your blog, so you can have the chance to decide whether to publish, delete, report as spam, or leave the comment unpublished. This tool is helpful not just for fighting spam but also for ensuring that only the comments you want to show are published. You can learn more in Setting Your Weblog Comment and TrackBack Preferences. Spammers will often target posts that are older, so we're adding an auto-close feature in Weblogs > Configure > Feedback. Auto-close will automatically close the comments to your posts after a specified period of time. You have several set time frames to choose from, ranging from one week to one year. This eliminates the need to go back to a post and manually close the comments - the system will do it for you! Note: Most of you can use this feature now, but some of you who are using Advanced Templates will not see the feature for another month or so. We're working to roll it out to everyone as soon as we can. There's more information in the Comment and TrackBack Preferences article. We're always looking for new ways to help users protect their weblogs from spam. If you have any ideas for how we can improve or enhance these features, leave a comment and let us know!